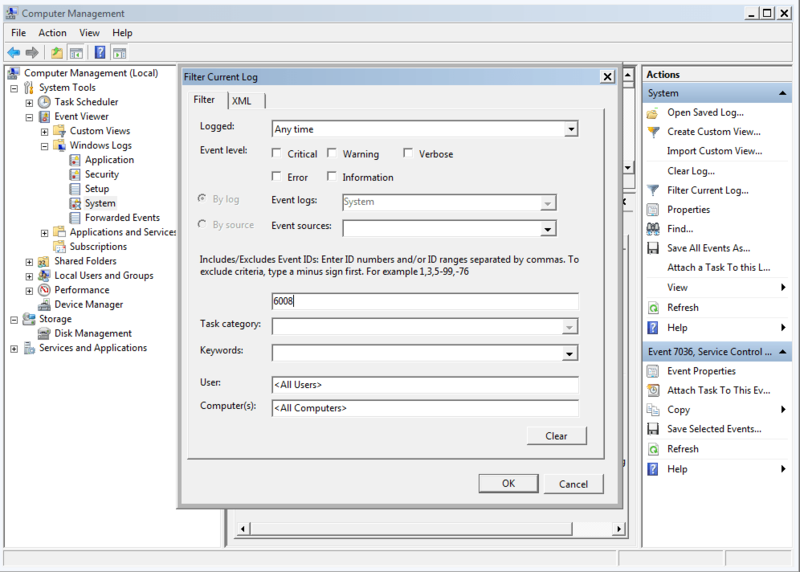 This blog will show you how to view the date, time, and user details of all shutdown (power off) computer events in Event Viewer in Vista and Windows 7. This is a cool way to figure out what’s going on with the machine if it’s shutting down all of sudden. I seen this issue several times and it’s normally the surge protector going bad, or some driver causing the issue. 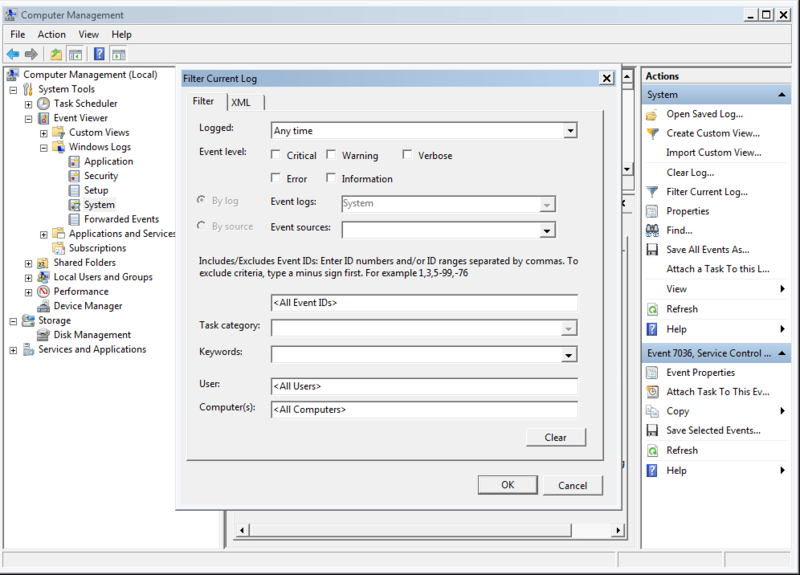 You must be logged in as an administrator to be able to view the Event Viewer. 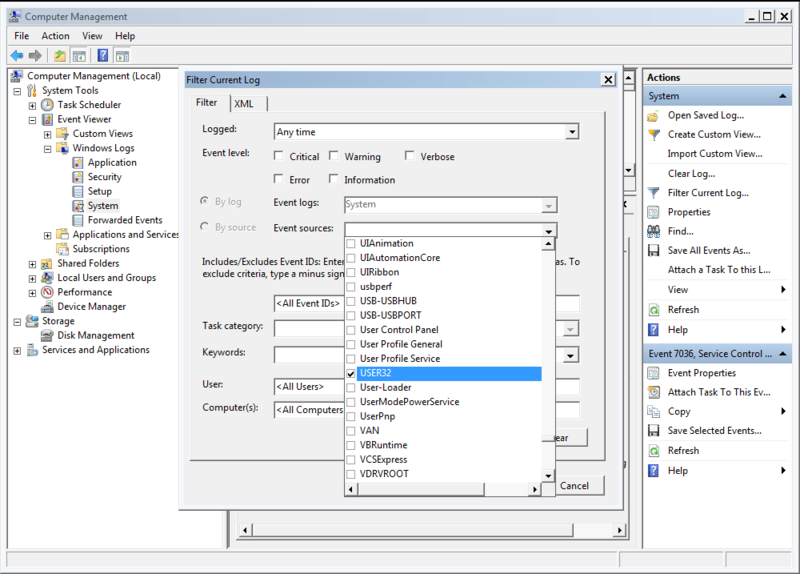 If you are smart and lazy and have the user’s computer name or IP address you could remotely connect to the workstation’s Event Viewer. 2. If prompted by UAC [User Access Control], then click on Yes (Windows 7) or Continue (Vista). 3. 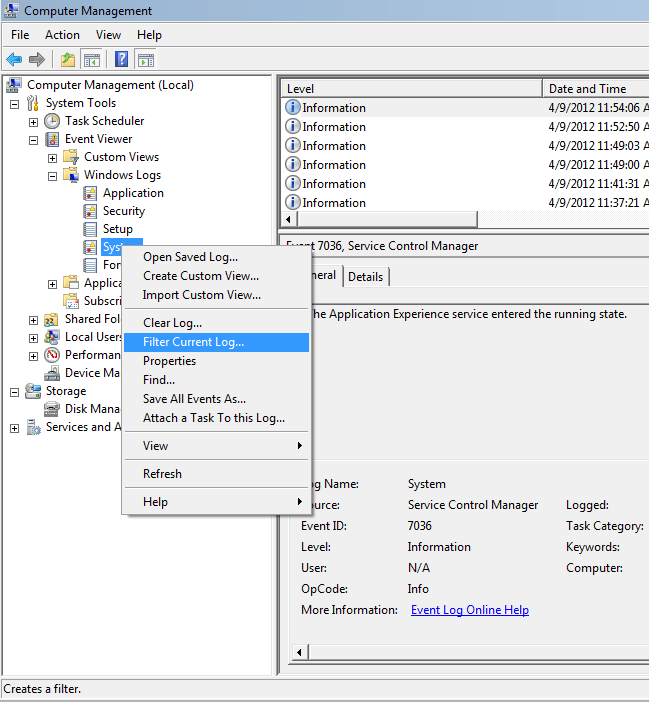 In the left pane of Event Viewer, double click on Windows Logs to expand it, click on System to select it, then right click on System and click on Filter Current Log. 4. 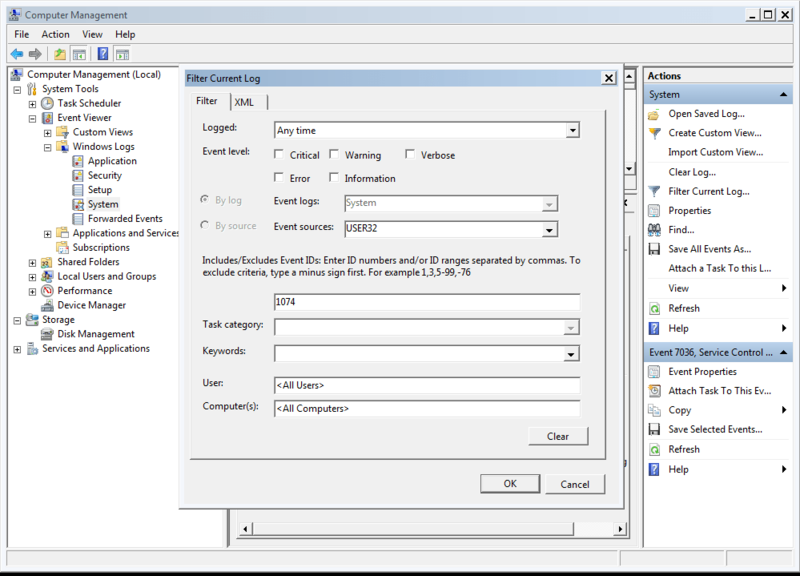 To See the Dates and Times of All User Shut Downs of the Computer, Click on the drop down arrow to the right of Event sources, check the USER32 box, and click in the <All Event IDs> field. In the <All Event IDs> field, type 1074, then click on OK. 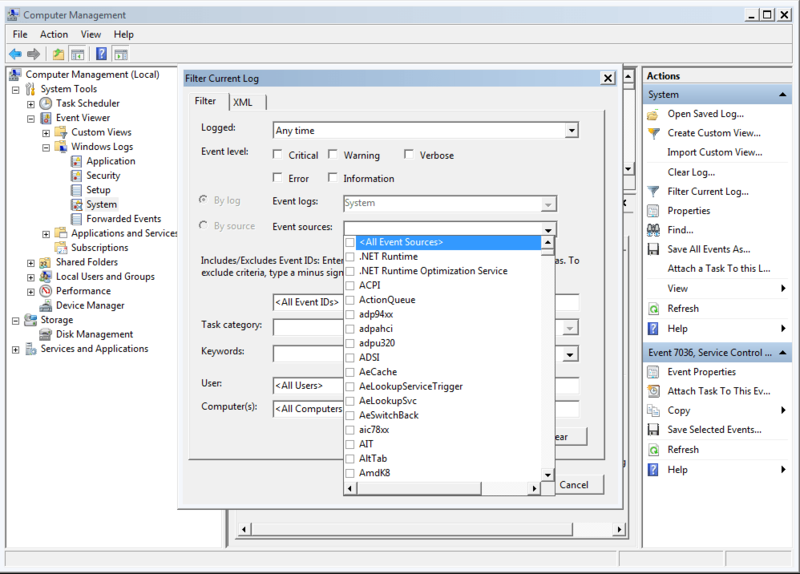 This will give you a list of power off (shutdown) and restart Shutdown Type of events at the top of the middle pane in Event Viewer. You can scroll through these listed events to find the events with power off as the Shutdown Type. You will notice the date and time, and what user was responsible for shutting down the computer per power off event listed. To See the Dates and Times of All Unexpected Shut Downs of the Computer In the <All Event IDs> field, type 6008, then click on OK. 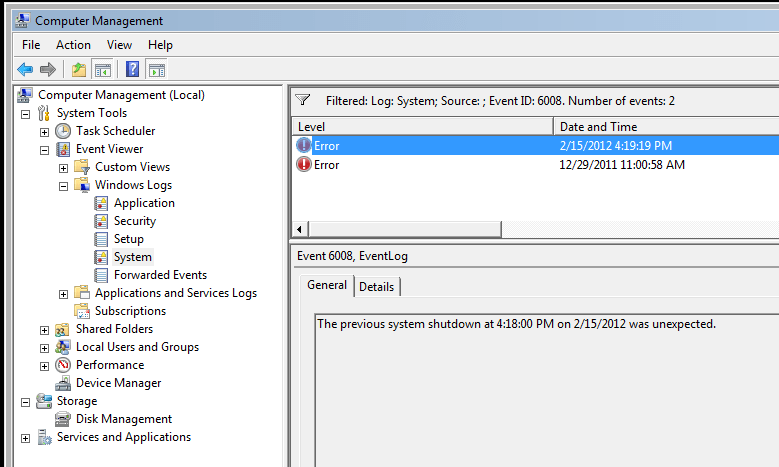 This will give you a list of unexpected shutdown events at the top of the middle pane in Event Viewer. You can scroll through these listed events to see the date and time of each one. thank you. Helps me track my brother’s logout time for windows 8.
now he cant escape from lie-ing and pay the electricity bill.